Below you will find wound care resources, including the AAWC Guidelines and Educational Brochures created by volunteer AAWC leaders to advance the practice of wound care. AAWC is proud to offer these free of charge. You may also wish to shop our AAWC Store for additional educational tools and products, such as professionally printed brochures. 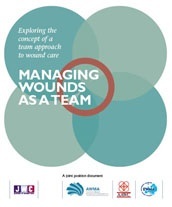 AAWC has partnered with the European Wound Management Association (EWMA) and the Australian Wound Management Association (AWMA) to develop a joint paper on the multidisciplinary approach to wound care. Access the document from the Journal of Wound Care by clicking on the icon to the left. – Robert J. Snyder, DPM, MSc, CWS. Current AAWC Secretary – Robert J. Snyder, DPM, MSc, CWS Discusses Debridement - View additional videos on the AAWC YouTube Channel! Paper on Consensus principles for wound care research obtained using a Delphi process. Read it here. Assessing the Need for Developing a Comprehensive Content-Validated Pressure Ulcer Guideline Learn more. Understanding Pressure Ulcer Research and Education Needs: A Comparison of the Association for the Advancement of Wound Care Pressure Ulcer Guideline Evidence Levels and Content Validity Scores Read it here. Development of a Content-Validated Venous Ulcer Guideline Learn more. The Development and Content Validation of a Multidisciplinary, Evidence-based Wound Infection Prevention and Treatment Guideline. Learn more. AAWC Quality of Care Wound Glossary – Search to find a standard definitions. AAWC Patients and Caregivers Resources – Find WIN Newsletters here!